With Black Friday and Cyber Monday and all of its deals over, Amazon has created a special day for pet deals on Pet Tuesday. Amazon is having a special for Pet Lovers starting tonight for Tuesday, November 27. They are having some terrific Doorbuster Pet Deals. 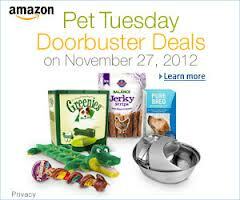 You can see all of their great Doorbuster Pet Tuesday Deals here. I will be looking around and updating my deal finds during the week so please check in again. Also, please comment and share any great deals or other bargains you find that may be of interest for pet owners. Did you find any good Pet Tuesday Deals to share? Recent price Drops on K&H Heated Pet Beds makes these a great deal at about 60% to 75% off of original prices..
K&H Thermo-Bed Quilted Pet Bed are now only $22 - $39 depending on size. The K&H Thermo-Bed™ combines the upscale look of an attractive poly fiber filled washable bed with the benefit of body temperature heat. Dual thermostats maintain a surface temperature approximately 12 to 15 degrees above ambient air temperature to your pet's normal body temperature when in use. The heater is removable for washing. Available in three sizes and three colors. Recommended for indoor use. My dog loves his pet bed and in the winter, I can't get him off of it. K&H Lectro Soft Outdoor Bed - Medium - $21.15, Large $34.66. The Lectro-Soft bed utilizes an energy efficient, thermostatically controlled heater designed to never exceed the body temperature of your pet whether in a comfortable indoor room or outdoors down to 20 degrees below. It warms to a desirable and soothing 102 degrees and includes a super-soft, removable and washable fleece cover that is specially designed to deliver maximum heat and comfort to your pet. Replacement covers are available. It is not recommended for pets that chew or are destructive in any way. If this is the case, try the Original K&H Lectro-Kennel. You can see all the K&H Pet Beds on sale here.